"We'll make them regret showing their puny alien faces around here." 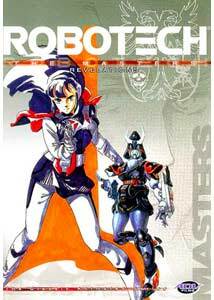 With disc number 8 of Robotech, we are getting the halfway point of the Southern Cross-based portion of the show, which tells the story of The Robotech Masters. This race had engineered the giant Zentraedi warriors as their slaves, but in the wake of the Zentraedi defeat at the hands of the United Earth Forces, The Masters now face the offspring of the original Superdimensional Fortress crew in an attempt to recapture the last remaining stores of the protoculture necessary for their survival. Another 15 years in Earth's history are covered in The Masters. Earth Forces have succeeded in downing a huge alien spaceship, but are unaware of its true significance. Attempts to attack the ship meet with defeat, but a plan is put in place to try to infiltrate the ship and discover the nature of their enemy. Lieutenant Dana Stirling, whose command of the 15th ATAC squadron was put in place after its commanding officer was demoted, volunteers his squadron for this mission. Soon, she faces difficulty when Bowie Grant, one of her crew, finds himself arrested by the Global Military Police. Grant's recent distractions have been the cause of some near-fatal mistakes on the battlefield. When Bowie ends up joining the team at the last minute, he can't be aware that he will be walking into a trap set by The Masters, who wish to capture Earth specimens to experiment on. Their mission will introduce us to more of this alien race, and give us a good tour of their ship. Where the first disc of The Masters dealt mainly with introducing the characters and the new threat to Earth's security, with this second disc the relationships between the members of the Army of the Southern Cross begin to come to the forefront. Dana finds her ancestry as the first half human, half Zentraedi child, to be distracting her, especially after her encounter with the alien Zor, who she faced on the battlefield piloting his red bioroid. Bowie finds himself captivated by a strange alien girl, and the womanizing former ATAC commander, Sean Phillips, will find himself a love interest before the disc is out. There is still an endless parade of battelfield encounters, and plenty of action. The added relationship elements help diversify interest and attention. We also are given hints about an even more deadly threat to Earth's survival, as the quest for the protoculture takes on even greater dimensions. While the presentation leaves a lot to be desired, the story is still entertaining, and seems to have potential. Image Transfer Review: Image quality again varies, though for the most part is pretty reasonable, with heavy grain limited to the opening episode, after which it's pretty moderate. Color shifts continue to be an issue, as does the weak color palette. Source damage is minimal. Overall, tending to the better end of the spectrum we have seen so far, but still underwhelming. Audio Transfer Review: Audio quality varies more than some of the other discs, though tends to be fairly sibilant most of the time. The final episode fares the worst with edgy to distorted dialogue in many places. Extras Review: Grab the collector's box if you want the goodies, as all you'll find on this disc are trailers for Farscape, Dai-Guard, Generator Gawl, Those Who Hunt Elves, Getter Robo and Princess Nine. The eighth installment in the Robotech collection puts us well into the plot of the second major story arc. Presentation quality continues to be variable, but the episode count/price point ratio remains attractive. Supplemental features remain isolated to the boxed configuration.